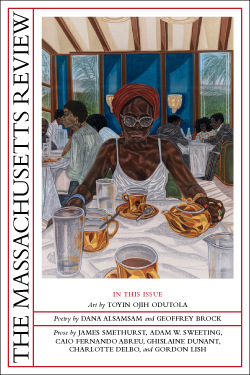 awarded by The Massachusetts Review! Geffrey Davis’s debut collection, Revising the Storm, was selected by Dorianne Laux for the 2013 A. Poulin, Jr. Poetry Prize, and will be published by BOA Editions in April 2014. Part of his work as a literary citizen involves promoting the poetry of others. To this end, he co-created and co-edits the online journal Toe Good Poetry. Davis holds degrees from Oregon State University and Penn State University. His awards include the Dogwood Prize in Poetry, the Wabash Prize for Poetry, the Leonard Steinberg Memorial/Academy of American Poets Prize, nominations for the Pushcart Prize, and fellowships from the Cave Canem Foundation and Penn State's Institute for the Arts and Humanities. His work has appeared in Crazyhorse, Hayden's Ferry Review, the Massachusetts Review, Nimrod, [PANK], and Sycamore Review, among others. Anne Halley was Poetry Editor of the Massachusetts Review for twenty-five years, and had a long association with the English Department at the University of Massachusetts, Amherst. The author of three distinctive novels of verse and many prize-winning stories, she enjoyed a long career as a beloved teacher both in the U.S. and abroad. The Anne Halley Poetry Prize is awarded annually, and is co-sponsored by MR and the UMass English Department. The $500 award is given to an early- to mid-career poet for the best poem to appear in the preceding year of MR, as chosen by two editors and a member of the English Department. The prize-winning poet is invited to give a Spring reading in Amherst.